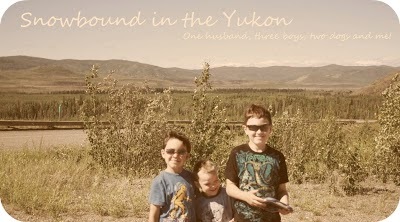 Snowbound in the Yukon: We are Family! The day started off kind of shaky, I was clumsy a bit and kept dropping things. But I got the kids out the door and myself a little late today. Not unusual when dealing with brood who are in every which direction and all have strong wills as well as strong minds. I tell you, they are going to be a handful when they get older. In actuality they get easier by the day, they are listening more as we've been move consistant with having conquences and follow through. SmartGuy and I had a heart to heart the other day. Saturday in fact, when we were having a family dinner. He gets very wound up and with 4 boys in the house that day there was lot's of roughhousing and wrestling and they wouldnt' stop. His friend he had over got sent home and he spent a good chunk of time in his room and he told his Dad he had to talk to me and it was very important. Well, let's say that he made me cry, he's feeling like he's a bad kid at school and daycamp and everyone thinks he's mean. I explained that he wasn't mean and that we all knew that and sometimes he makes mistakes like everyone else and we just have to think before we do. We talked for a bit and he had some ideas and I had some ideas and he's been doing a bit better since the talk. He's very aware of everything around him and it just makes it all the harder to keep him naive and protected from the world.I made sure he knew and understood that we loved him and would help him and remind him to watch and understand and make changes. I told him that no matter what he's worth it! He's always been a boy who needs to move and he ofter does before he thinks. This is his main problem. He's a good boy, he's smart and funny, loveable and sweet but he often thinks of getting a reaction and for some reason just does these strange things. One thing we really have to focus on is his behaviour with his brother. For some reason and I'm sure I know what is that he always is hurting Buddy, he'll hit him or kick him or pretend to. He throughs things at him and says he was trying to through over. One rule in our house is not to through anything. The jealousy has been there since the day Buddy was born. Buddy dethrone SmartGuy in a way and him being a smart little three year old knew that there was a big change and that reason was Buddy. Besides that SmartGuy has a pretty intense personality and we see how this has come about! So the name of the game is now being fair. We've really been working on being fair between sibling fighting as the focus used to be on SmartGuy (because he was older and should know better, dumb I know) but now it's equal and they both get sent to their rooms for cooling off time until they are ready to apoligize and not fight anymore. The weird thing is the SmartGuy is the total opposite with Bubba. He would never think of hurting Bubba in anyway but still is always holding and huggin the boy. It's like Jekell and Hyde it's so different. The problem is that Buddy seems to do the things that SmartGuy does to him to Bubba. It's this horrible little cycle we are trying to nip in the bud. One example of how kids pick up things. This weekend Bubba came up behind SmartGuy with a truck and hit him in the head. He came around to the front and SmartGuy got angry and slapped it out of his hands. Both Hubby and I were, don't do that, that teaches him. And meanwhile Bubba had run over to his toy picked it up, turned around and threw it right at SmartGuy again hitting him in the head. So we had to sit them both down and inform them in age appropriate ways that that wasn't acceptable. It's a 24 hour job I tell ya! So we had a busy weekend, Saturday was all about cooking and cleaning and my family came over for dinner. It's always nice to have family around, for short periods of time anyway. Sunday was a lazy day we cleaned up again, I read, the kids played, Hubby went to his shop for awhile, he came home they all played Wii and then we went outside and I went berry picking. Check out NotJustCheesecake for pictures of my berries. I'm coming down with the cold the boys had and it's not so nice but I'm at work. The cold is in my neck and head and I'm tired. Bubba is feeling way better and has pretty much been sleeping through the night now (yeah who). Buddy has still got a wicked cough that has him coughing a lot at night. Poor guy sounds terrible. But he is acting normally otherwise.Yup, we are all good and busy and happy for the most part. It's all good! My kids do that too and it drives me NUTS-O! I can't stand that they do that... Reading about that was just like I had written it myself.